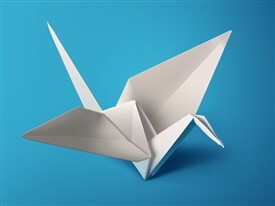 Make an origami bird with your message of hope. We are asking you to make an origami crane to show your support to people who have moved from their home. Particularly people who are forced to leave and are part of the ongoing refugee crisis. 'Give your Voice Wings' is led by the National Museum of Ireland - Country Life and the artist Bryan Gerard Duffy. The project coincides with the temporary exhibition Migrant Women - Shared Experiences. We are collecting up to 1000 birds that will form a flock in the museum café art space. This exhibition will represent an Irish response to migration. You can write or draw on a square piece of paper before making it into an origami crane. Here are instructions on how to make the origami crane: http://www.origami-instructions.com/origami-crane.html. All origami birds have to be made from either blue or white paper. You can drop the birds to the museum or post them to: Education & Outreach, National Museum of Ireland - Country Life, Turlough Park, Castlebar, Co. Mayo. If you are visiting the museum there are instructions and paper at the museum reception. We would like to collect to collect all birds by the end of January 2016.